Hauskaa lauantaita, tervetuloa Allsorts haasteen pariin! Kotieläimet aiheena, kissat ja koirat, mitä kotoa löytyy! Tein pari koirakorttia. Hi; Happy Saturday, it's time for a new Allsorts Challenge! Pets Awareness week, so we want to see your domestic animals, cats, dogs... not wild animals. In this card I made the image's background with bokeh technique with Distress Oxides - now it resembles the Penny Black 's patterned paper! Leikkaan kortit - Cards and Crafts 2008 - 2018, 10 years celebration year! 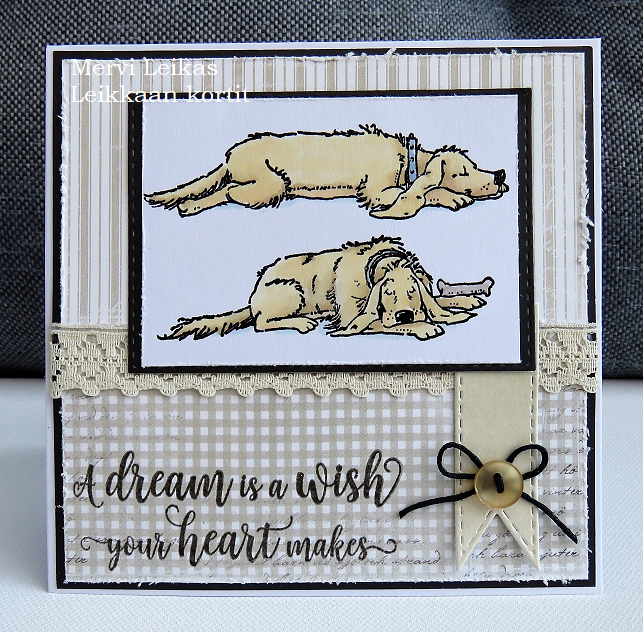 Adorable dog images Mervi, perfect for this weeks theme and especially like the one drawing out the colours from the Penny Black papers. Voi miten ihania! Tykkään erityisesti jälkimmäisestä. Two fabulous cards, love the images and the super designs and papers on both cards. I love how the background on your second card ressembles the DP and the ballons fit right in as well. Your first card is lovely too, with the sentiment being as much the focal point as the dogs. Gorgeous cards Mervi! I love the image you've used, it's adorable. Two wonderful cards so perfect for the challenge this week! I love these Mervi, the design on your second is gorgeous.